Paragliding in Medellin is among the best adventures you can experience in Colombia. Choose your paragliding company wisely to avoid risks and enjoy the sublime flight. 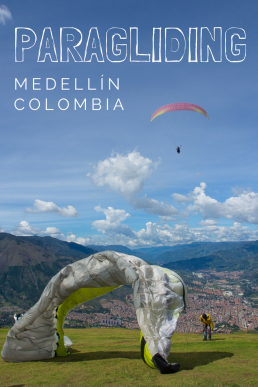 Read on to find the best paragliding spot in Medellin and take off from the green hills, spin in the air and enjoy the sceneries over the red-bricked cityscape of Medellin! While putting on a paragliding harness, I’m staring down at the meandering skyline of Medellin, shivering from the second thoughts. A couple of brave-hearts are already gliding through the sky, some spinning recklessly, the others gaining altitude firmly. I’m envious of their infinite panorama over the green hills that guard the valley of Medellín and the tapestry of the red-bricked roofs below their feet. The urge to see the world like a bird convinces me to push my boundaries: I’ve come this far to paraglide upon Medellin, so let’s do it! My paragliding instructor wakes me up, telling that the weather is just perfect today, as the wind is “only” 22 meters per second. I ask, nervously, if we’ll use an engine. The answer is negative; we are just free-flying. I’m thinking how much skill it would take to glide more than a thousand meters upwards and not to fall down when a sudden blast takes on the light-weight paragliding wing. There will be turbulence, I’ve heard, and I can clearly see how the airborne paragliders struggle. What if a nasty blast whisks us too high, or our paragliding wing collapses? We’ve been paragliding before, but it was more than six years ago in Romania, and I was as terrified back then, as well. But somehow it felt more safe, as we were backed up by a motor, and just descending from the mountains of Brasov – not free-flying upon an enormous valley, and a city, like the paragliders of Medellin. Maybe my fear of heights has grown bigger, or the 1,5-hour bus trip to the hills, followed by a short, but grueling climb upon the peak, just took its mental toll. My head is buzzing, but in the shadows lurks still the old excitement – I’m pretty sure I’ll love the paragliding experience nevertheless – at least when it’s over! 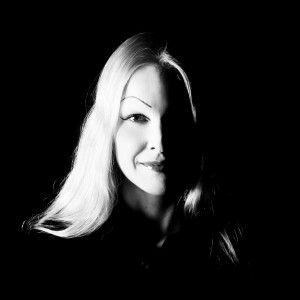 I watch how Piritta takes off, seemingly excited. For the next 20 minutes, I won’t let her parachute out of my sight. Just before the landing time, I lost the blue and white paraglider wing behind the trees. Immediately, threat scenarios fill my mind. Suddenly, Piritta and her paragliding instructor tumble back on the hilltop, laughing out loud. My relief is mixed with a flash of horror, as my instructor says that it’s our time to take off. We walk to the parachute, and the team runs to us, quickly attaching our harnesses into the aircraft. Strong wind beats us down several times before we even try to run off. While trying to run, I fall bringing down the promisingly kiting parachute. The team calms me down just to make me realize how nervous I am. I decide to keep my legs and finish the take-off. Next time, a hearty breeze helps us to lift in the air smoothly. We’re getting altitude quickly, swinging from side to side. Still pressing the metallic sidebars of our paragliding wing, I’m all smile. Taking off is always the hardest part; now it’s time to enjoy the ride over the valley of Medellin. We are floating on the breeze like a bird. I rest my eyes on the vast urban texture of Medellin that wiggles over a hilly surface, evading from the green peaks. From the air, it’s easy to believe that Medellin is the second biggest metropolis in Colombia. The neighborhoods of Medellin have such a pleasant small town feel that the city feels smaller when you walk the streets. Excelling my limits feels amazing, again. Last time I challenged my fear of heights by jumping a bungee from Victoria Falls Bridge in Zambia. I wasn’t sure if I ever enjoyed the bungee, but this time I’m ecstatic. For a moment, we glide together with an eagle. I’m bursting with feelings of unlimited freedom and joy. The hillside is peppered with small farms, and at lower altitudes, I can even recognize cows and goats wandering lazily around the pasture. We make a small detour to see nearby waterfalls and hills. Just when I feel in harmony with the surroundings, my pilot asks if I’d like to have some adrenaline. With a sudden flash of confidence, I nod cheerfully, though I know from experience what’s in store for me. During the next five minutes, I got a taste of “paragliding acro” like the pros call it. Paragliding aerobatics is freestyle paragliding, performing all kinds of tricks in the air. 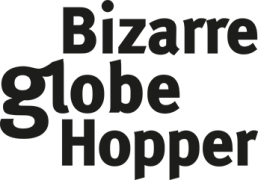 Nowadays the daredevils compete in yearly World Paragliding Aerobatics Championships. We’re spinning in the air, losing altitude quickly, then almost touching down before getting high again – just to do some more spinning. I laugh recklessly, awe-struck. I’m having a blast, but not without my old companion, the fear of crashing down. That's me paragliding over the skies of Medellin, Colombia! Is it Safe to Go Paragliding in Medellin, Colombia? I’m not the right person to ask, but due to my fears, I’ve studied some statistics about paragliding safety. When you’re taking a tandem flight, an experienced pilot with proper paragliding equipment serves as your safety net. So choose your paragliding operator carefully. 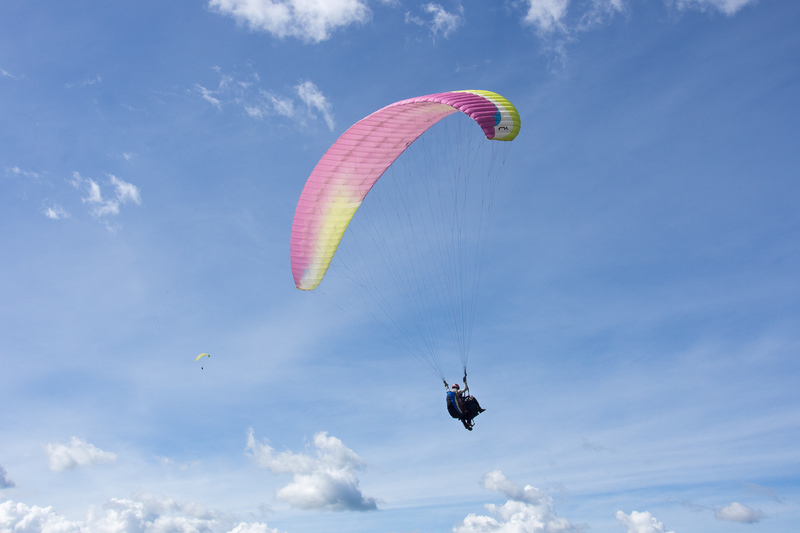 Almost all accidents are caused by the mistakes of the paragliding pilot or poor weather. Agreeing to “the adrenaline ride” has its risks. Luckily, a professional pilot won’t do any “acro tricks” unless you ask for them.  Spinning – or spirals – might cause the pilot to black out. Vertical wingovers might collapse the paragliding wing. Paragliding too low is risky because of the wires, though I didn’t see them on Medellin’s paragliding location. There’s also a nasty “downwind demon”, a risk of colliding with something due to the illusion that haunts pilots only when flying too low. 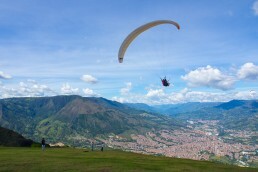 In Medellin, the landing area seemed huge, making it a secure spot to paraglide even for several paragliders at a time. Still, it might be fatal if you crash into another paraglider in the air, but an experienced pilot knows the risks. According to statistics, paragliding is as almost safe as driving. 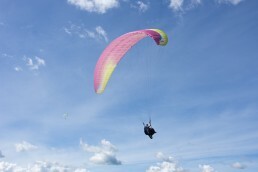 Paragliding is safer than for example motorcycling. Skydiving is about four times more dangerous than paragliding. More than 90 % of paragliding accidents happen within the first ten flights of the pilot. All tandem pilots are naturally experienced. I find these numbers extremely calming. Still, there are some risks, which you can avoid though you’re not the pilot. 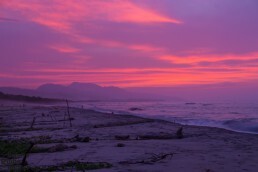 Weather-wise, the best times to go paragliding are the first and three last hours of daylight. That’s also the timeframe RubenFly, our paragliding operator in Medellin, suggested, though we picked another timing. We were still lucky to get clear skies. Afternoons might bring clouds and even thunderstorms. If you’d prefer paragliding down to Medellin, book your paragliding activity for the morning hours (before 10.30AM). Usually, it’s not possible to land down in the valley during the midday, as hot weather from the city sends heat up. Then, you’ll end up landing in San Felix like us. The paragliding spot in San Felix gets crowded with local aficionados during the weekends, so if possible schedule your paragliding adventure for any other weekday. It’s always safer to take off and land when there are less people around. Whereas many tour companies in Medellin sell paragliding tours, we would strongly recommend booking straight through a true paragliding operator (search for “paragliding medellin”, “paragliding companies medellin”, or in Spanish “parapente medellin” from Google). That way you know the company you’re dealing with and can also double-check their reputation. Check that the operator is licensed and certified. We were paragliding with Ruben Fly, a pioneering paragliding company in Medellin. They hold a record of more than 8000 successful flights without accidents. 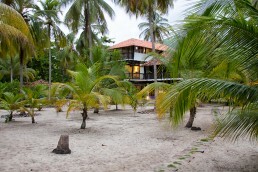 Overall, Colombia is a perfect paragliding destination with several top-notch sites. You can enjoy morning thermals and afternoon soaring with safe landings. 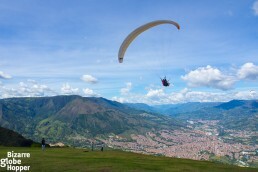 The most popular paragliding sites of Colombia are in Medellin (Antioquia) and Santander: Bucaramanga, San Gil, and Parque National del Chicamocha between the latter two cities. Santander is known for more challenging weather conditions than Medellin. Generally, tandem flights are handled professionally and safely everywhere and most operators also offer courses. 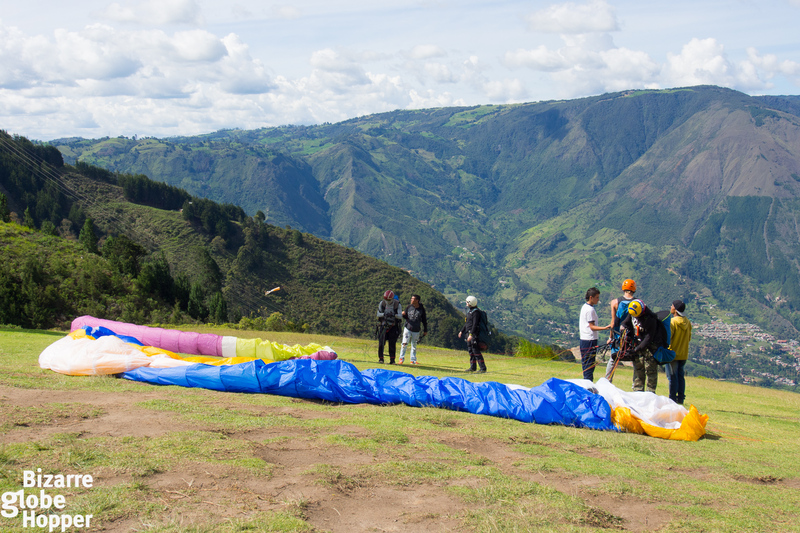 In Colombia, paragliding is possible nearly every day around the year! 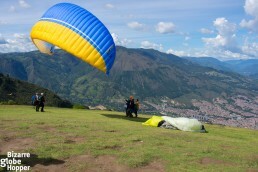 Most paragliding companies in Medellin operate in the small town called San Felix. Usually, the company offers transfers if you’d like to book them separately. Private transfer (or taxi) cuts the distance between San Felix and Medellin’s city center in 30-40 minutes. With public transport, it took for us a little bit more than one hour to reach San Felix. We traveled by metro to San Javier (line B) and took a cable car to Aurora (yellow line). Then, we took a local bus to San Felix according to Ruben Fly’s instructions (ask the specifics from your paragliding partner). It felt very easy to find the spot. As the bus crawls all the way up to the hills, the views get more amazing with every kilometer. Thus, for us, the bus ride felt pleasant enough. If you decide to take the metro/cable/bus combination and travel through San Javier, please consider visiting the outdoor escalators of Comuna 13 either before or after your paragliding experience. It’s an inspiring neighborhood with a troubled past, once dubbed as the murder capital of Medellin. Visiting Comuna 13 independently to explore the world-famous outdoor escalators and blooming street art scene is considered safe. Check out our separate article for more information! What to Pack for Paragliding in Medellin? The altitude of San Felix is 2378 meters/7805 ft: you’re already 1000 meters higher than the city of Medellin! Thus, the climate in San Felix is slightly cooler and it only gets colder up in the air. You might want to pack a sweater or light jacket. Forget flipflops and take sneakers or some other good shoes instead. Otherwise, your paragliding company will offer all the equipment you need. If you’d like to go paragliding with RubenFly, as we did, you can either send email to paraglidingmedellin@gmail.com or text/WhatsApp to +57 310 517 7940 (Ruben Montoya, the owner of RubenFly). We are not affiliated with them, but can wholeheartedly recommend their professional service. We felt safe at all times. You can reach Medellin from other parts of Colombia by driving or taking a bus or internal flight. We recommend flying if you’re short on time, as the mountainous roads leading to Medellin for example from Cartagena and the Caribbean coast are unpredictable. Even locals prefer domestic flights instead of tiring drives. Check how to book cheap flights within Colombia with these simple flight hacks! 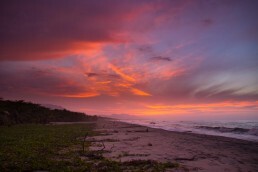 If you’re still planning your adventures, you might want to check our Colombian one-month itinerary, as well. I recommend trying paragliding at least once – even if you have a mild fear of heights. The essence of paragliding is just floating calmly in the air and enjoying the scenery: it’s more like airborne sightseeing than wild adrenaline activity. Paragliding in Medellin is a perfect introduction to the sport of paragliding since it feels safe and adventurous at the same time and the stunning birds-eye view will leave you wanting more! Amazing! Looks like you had perfect weather for your flight. I just flew with Rubenfly’s company and 100% second your recommendation. It was my first time and it far and away exceeded my expectations. And with views of the city and the countryside, like you mention, I can’t imagine a better spot to do so than Medellin. Hi Cris! So thrilled that you got do the same, it was amazing! Thanks for reading our take on the paragliding experience. One of my sweet memories from Colombia. Happy travels! Wow! That looks like fun and yet it looks even more scary. It is probably my fear of heights though. If my husband had a chance he would drag me on one crazy adventure after another. He still manages to get away with most. That being said it definitely is something that a person would love to check off their bucket list. Hi Penny! I’m sure that your husband would love paragliding – and I’d recommend you to try it, too! I was so scared before taking off, but trust me, in the air you’d just marvel the sceneries and forget the fear. Please let me know if you decide to go paragliding: I would love to read about your experience! So glad to hear! Medellin is amazing and paragliding will blow your mind! Hi Katrina and Ariana! Thanks for your support! I’d highly recommend trying paragliding anywhere you have a chance to do it. Happy travels! Love how much info you provide and statistics!!! I’d be scared but it is still definitely something I would like to do, paraglide. I’d prefer by the seaside though (although now I’m afraid of the wind factor??) Great post!! CHEERS! This is such a dream of mine and so high up on the bucket list – I can just imagine the absolute fear when you take off. Congrats for being such an adventurer!